A 58-year-old woman presented with signs and symptoms of cervical myelopathy. Magnetic resonance imaging of the cervical spine demonstrated C3–4 and C4–5 disc herniation with spinal cord compression. She underwent C3–4 and C4–5 anterior cervical discectomy and fusion. 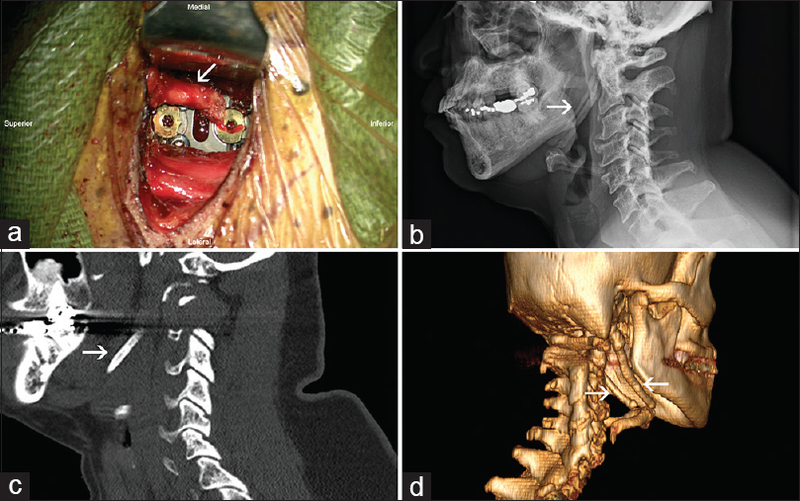 A hard cord-like structure with unclear etiology and origin was encountered in the retropharyngeal space anterior to the prevertebral fascia during the surgical exposure [Figure 1]a. An intraoperative ear nose throat (ENT) consultation confirmed the structure to be a calcified stylohyoid ligament. Careful review of the preoperative cervical X-rays and computed tomography of the cervical spine confirmed the presence of a calcified stylohyoid ligament correlating with the intraoperative findings [Figure 1]b, [Figure 1]c, [Figure 1]d. The calcified stylohyoid ligament had to be retracted medially with the anterior cervical retractor blade and the procedure was completed uneventfully. The stylohyoid ligament is a fibrous cord between the tip of the styloid process of the temporal bone and the lesser horn of the hyoid bone and is a normal anatomical structure. Calcification of the stylohyoid ligament is not uncommon in the general population and is often a benign finding. Patients may present with symptoms such as chronic pain in the pharyngeal region, otalgia, phantom foreign body sensation, and dysphagia; however, it is often the etiology cited in patients with Eagle syndrome.,, Visualization of a calcified stylohyoid ligament during anterior cervical exposure, as demonstrated in the clinical images, is exceptionally rare for spine surgeons and could possibly be due to the detachment of the ligament from the lesser horn of the hyoid bone during surgery, as likely happened in the present case. As it is usually attached to the lesser horn of the hyoid bone, it is not typically encountered during anterior exposure for cervical fusions. Awareness of this innocuous anatomical variant is important for spine surgeons and trainees to confirm the diagnosis during a high anterior cervical spine exposure and to avoid intraoperative concerns. Ferrario VF, Sigurtá D, Daddona A, Dalloca L, Miani A, Tafuro F, et al. Calcification of the stylohyoid ligament: Incidence and morphoquantitative evaluations. Oral Surg Oral Med Oral Pathol 1990;69:524-9. Öztaş B, Orhan K. Investigation of the incidence of stylohyoid ligament calcifications with panoramic radiographs. J Investig Clin Dent 2012;3:30-5. Sudhakara Reddy R, Sai Kiran Ch, Sai Madhavi N, Raghavendra MN, Satish A. Prevalence of elongation and calcification patterns of elongated styloid process in south India. J Clin Exp Dent 2013;5:e30-5.